Savory Lotus may receive commissions from purchases made through links in this post. 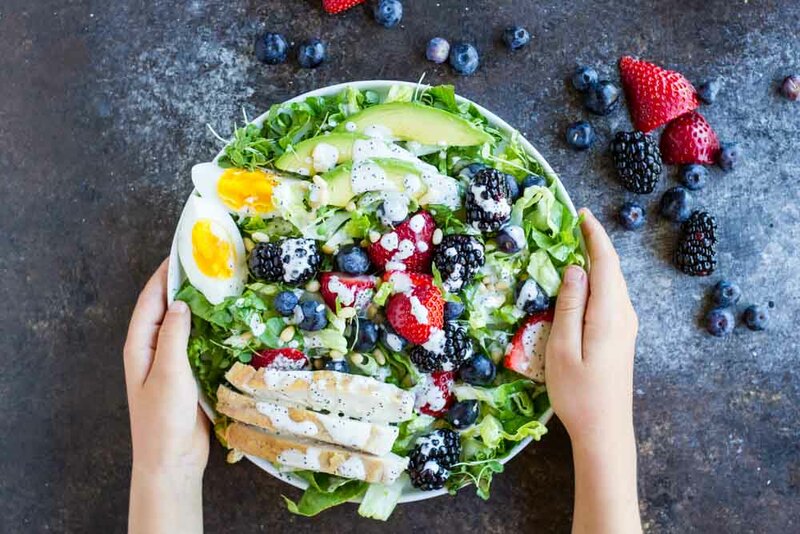 Loaded with fresh berries, avocado, chicken, hard boiled eggs, crunchy romaine, micro greens, and a creamy poppyseed dressing, this is the PERFECT summer salad. WooHoo! It’s finally warm here in Northern California. And the Farmer’s Market is starting to be full of my favorite summer things. 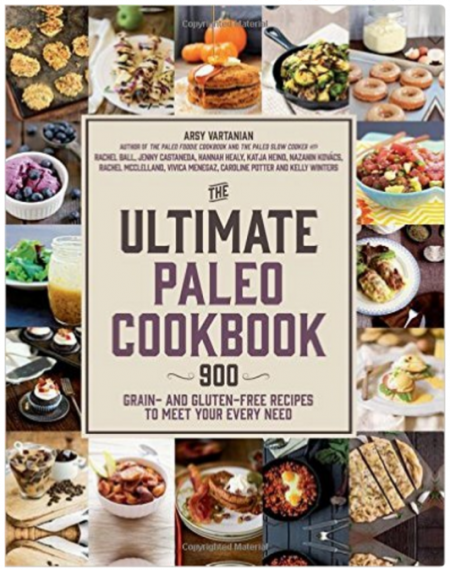 Which means I’ll be posting lots of healthy, easy summer recipes to get us through the next few warmer months. I tend to avoid cooking and baking as much as I can when it gets hot. I tend to eat lots of salads all summer long. And I’m a big fan of adding tons of good quality proteins and healthy fats to keep me fueled and full. Keeping the fridge stocked with lots of fresh vegetables and favorite salad fixings makes this super easy as we are often landing home right at dinner time after an active summer day. With just a bit of meal prep on the weekend, I set myself up to eat well for the rest of the week. My family is all about condiments so we usually make one or two homemade salad dressings every week. Dairy free ranch, homemade honey mustard, creamy turmeric, and creamy green goddess are all on regular rotation. 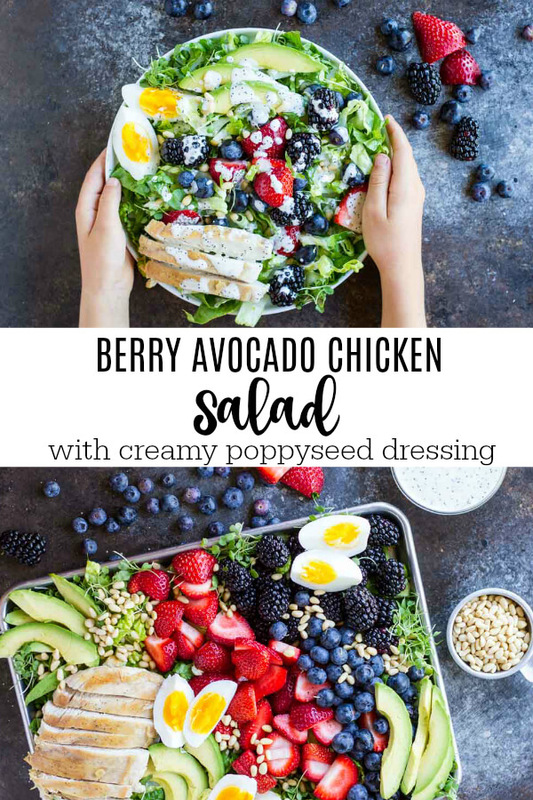 My Little One has declared that the creamy poppyseed dressing from this recipe is her new fav, and she only wants to eat that one from now on. As far as protein goes, hard boiled eggs can be made a day or two in advance. So can easy pan-seared chicken or steak. This makes throwing a salad like this a breeze when you’re hungry and ready to eat. Check out the recipe below for my quick and easy way to pan-sear juicy chicken breast. It has been a real game changer for me as I really can’t stand dry chicken. No thanks! What’s not to love? It’s super easy to throw together. It’s full of summer love with those juicy berries. The crunchy romaine keeps is fresh and light. The micro greens adds some extra green goodness. Avocado adds that healthy fat. And the chicken and eggs keep everyone happy and full. And let’s not forget about that creamy poppyseed dressing. It pairs beautifully with the sweet flavors of the berries. This salad is perfect for summer lunches and dinners. It packs up nicely for a fun picnic on the go. However or wherever you serve it, your people will be happy. To make dressing: in a small bowl, whisk all dressing ingredients together until creamy smooth. Adjust for lemon flavor and salt. Set aside. To assemble salad, arrange romaine and micro greens on a large platter. 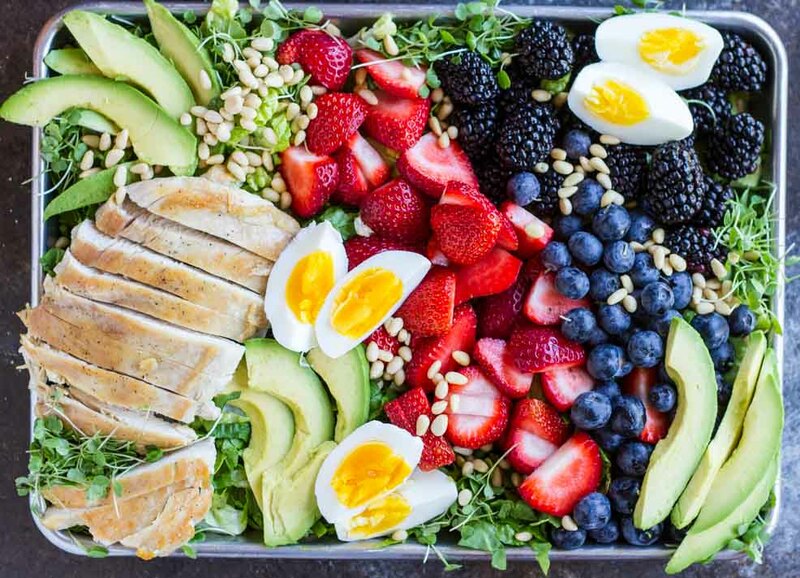 Add cooked chicken breast, sliced eggs, berries, avocado, and pine huts. Drizzle on dressing. Serve and enjoy! 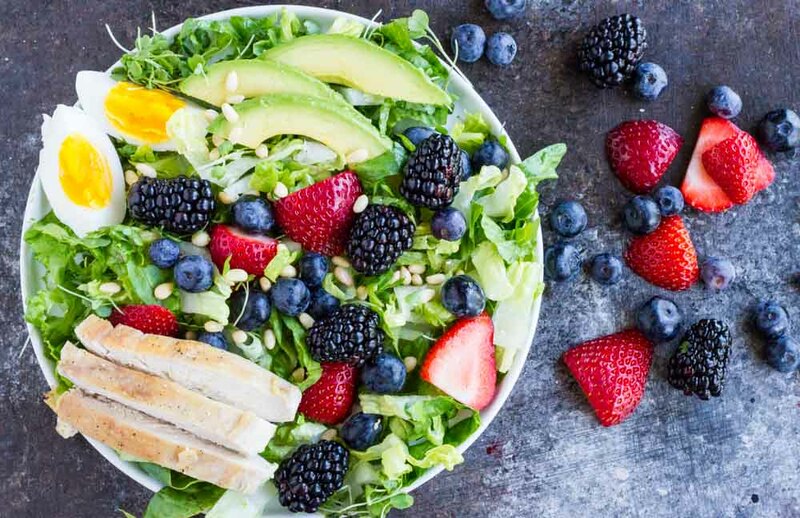 Alternatively, you can plate romaine and micro greens on four individual plates and divide salad fixings evenly on top to make four individual servings. Drizzle dressing on top and serve. This recipe works with any type of cooked chicken, grilled, baked, or pan-seared. The easiest way to cook chicken breast is to lightly pound chicken breast into one inch even pieces in between 2 pieces of parchment paper (I use my rolling pin.) Lightly salt and pepper each side. Heat 1 tablespoon of your fav cooking fat over medium heat. Place chicken breast into pan and cook for 6 minutes without moving it, until golden brown and easily lifts from pan. Add 1 teaspoon of butter, lifting chicken so the butter flows underneath. Cook for an additional minute. Flip chicken and cook for 5-7 minutes, until chicken is cooked all the way through. Remove pan from heat and allow chicken to rest for a couple of minutes. The easiest way to make perfect hard-boiled eggs is to steam them in a steamer basket. Once water is boiling, add eggs to steamer basket. Generally I prefer soft boiled eggs at 7 minutes. For this recipe, I steamed them for 9 minutes. I prefer my eggs slightly “wet”. For fully hard boiled eggs, you would do about 11-12 minutes. Click HERE to PIN THIS!! besides the amazing gorgeousness (I know, not a word! ), that DRESSING!! Drool! Thank you, Tessa! I love love pretty food. 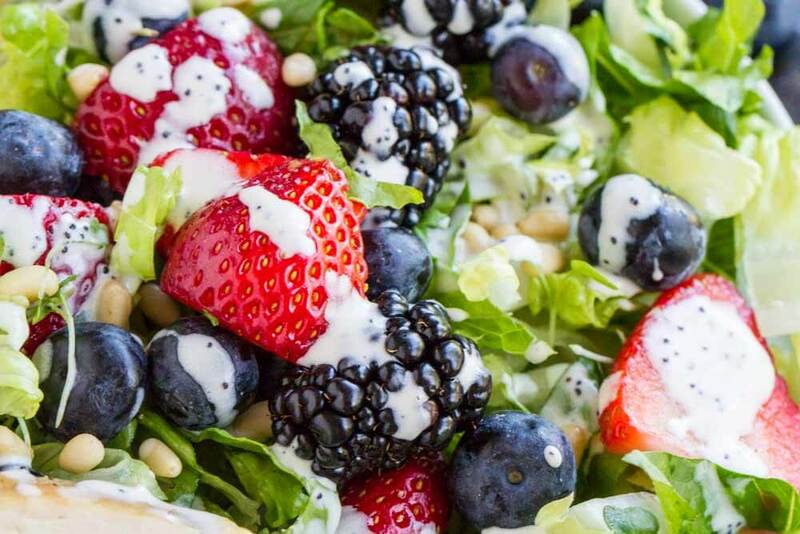 I absolutely love berries in salads and this one is so gorgeous! Can’t wait to give it a try. This is probably the prettiest salad I’ve ever seen! 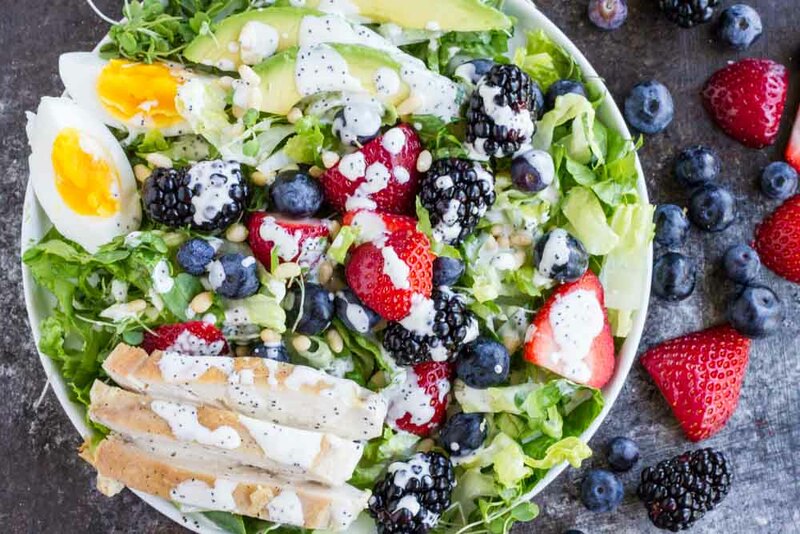 This is my favorite way to eat all summer long, and that creamy poppyseed dressing looks incredible! Me, too! I’m so in love with this super easy dressing. Holy cow this is so beautiful!!! This is the most gorgeous salad EVER! Love all of the colors, flavors and textures. Awwww! That’s so sweet, Emily! Thank you! Me, too! Lots of fresh foods and little cooking. 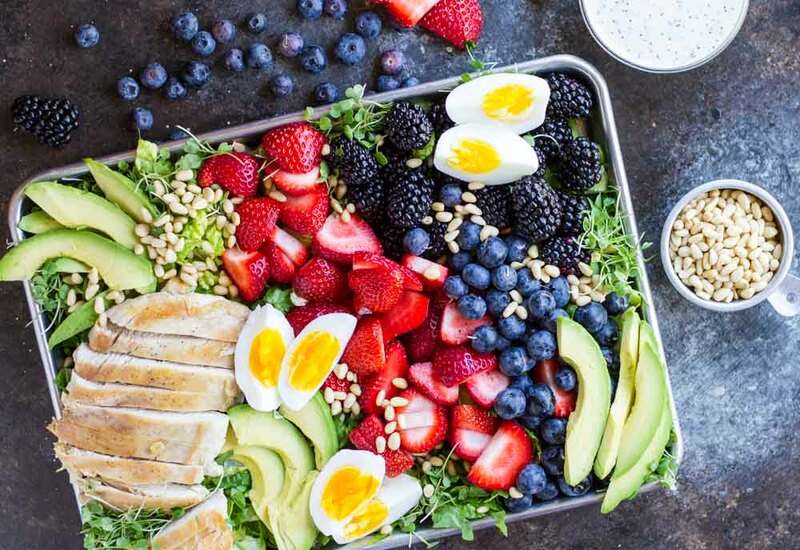 This is the prettiest salad ever and your pictures are gorgeous! I could definitely eat this all summer! Yum! Jessica, that is so sweet of you. Thank you! Love the color and so summer perfect ! Thanks for sharing ! Yes, it’s my summer go to salad, for sure! I love all the colors – also it looks so tasty! 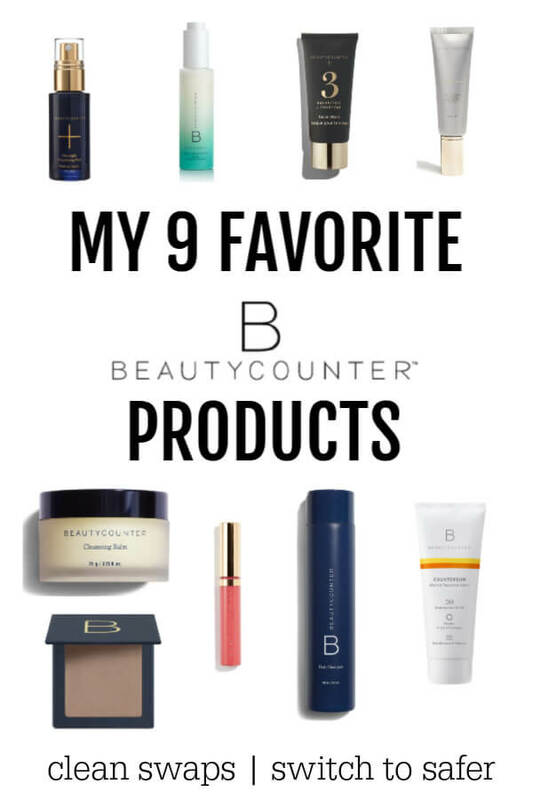 Love the avocado… adding it to my roundup! 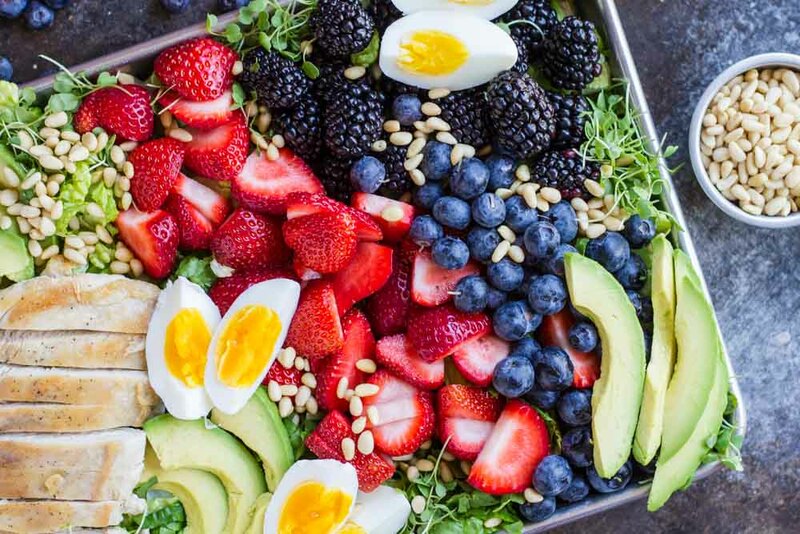 This loaded salad looks like it has everything I need! We are a few weeks behind NoCal, but excited for the summer haul! Yes! 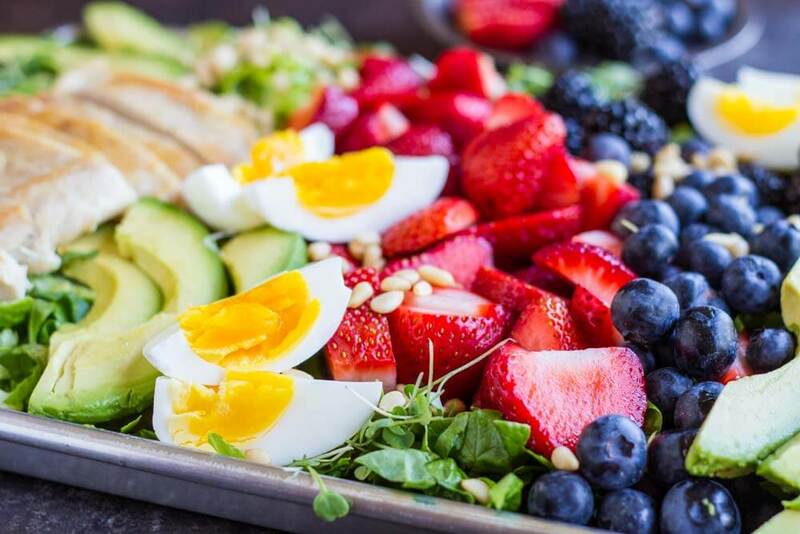 It’s a super loaded salad with all the good stuff! I suppose this is a more protein dense alternative to a fruit salad – it’s got my vote! Aww! Thanks, Georgina! 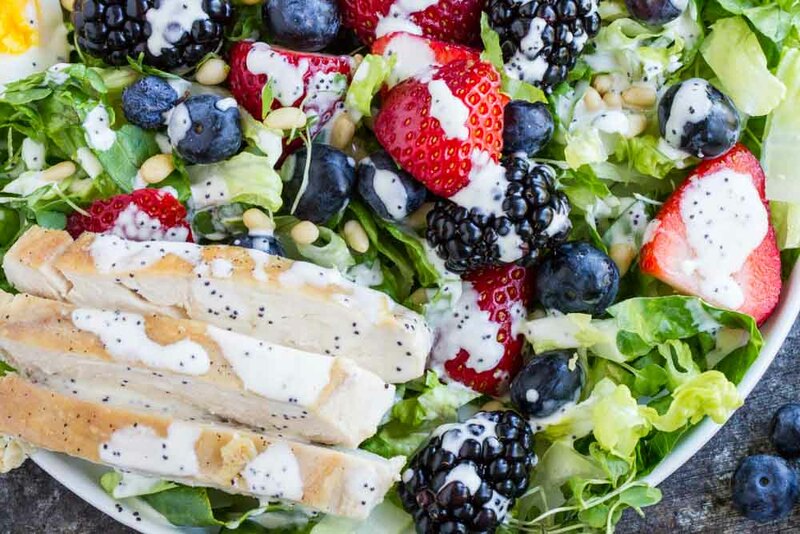 The berries really make this salad so lovely. Visit Savory Lotus' profile on Pinterest.